I have not hidden my frustration with the way the defensive pairings broke camp this season for the Boston Bruins. With Adam McQuaid out for quite some time still, Bruce Cassidy has not been able to run these pairings. That being said, I shudder to think that he will just go back to the way it was before McQuaid was injured because that is not how the defensive corps needs to be structured to ensure success in Beantown. So, let’s talk about it. I would like to state before beginning that there is no 1st, 2nd, and 3rd pairing, nor should there really be in the big scheme of things. With the players available to Boston, the 6 defensemen should be handled in a more balanced approach, in order to maximize their talents. This is a pairing we have seen a bit since the McQuaid injury, and I have wanted to see this for quite some time. A theme you will find throughout this article is players of complementary skillsets. Torey Krug is a tremendous offensively gifted defenseman. That is a fact. It is also a fact that, although he is good enough to play defense at the NHL level, the weakest part of his game is his ability to break up plays in his own zone. This is somewhere that Brandon Carlo excels. Krug has always been partnered with a stay-at-home guy so that he can play his game unencumbered. 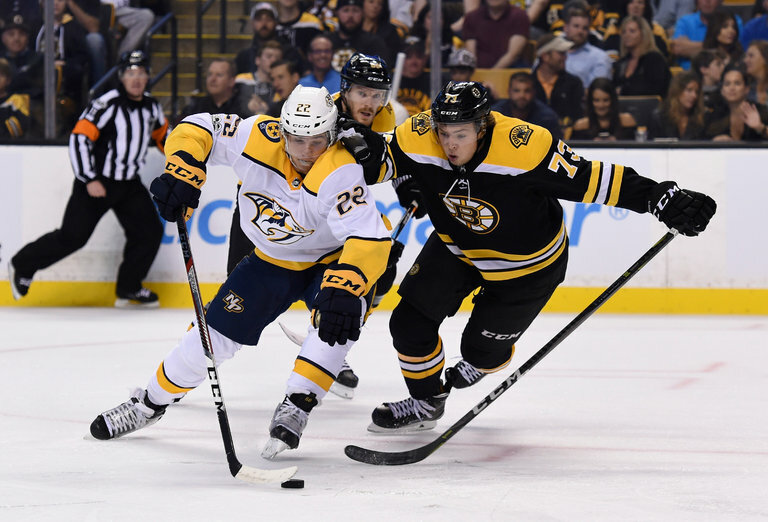 Unfortunately, when that guy is Adam McQuaid, the person Krug has spent the overwhelmingly most amount of time within his career, Krug is put between a rock and a hard place – his partner can’t do anything other than play the body. Carlo offers a slightly different skill set to partner with Krug’s dynamic puck skills. He is the modern definition of a shut-down defenseman. He is big, physical, and most importantly, a tremendous skater. Carlo excels at disrupting plays in his own zone, mainly behind his own goal line. Now, isn’t that what we decided Krug’s weakness was? Exactly. Carlo complements Krug nicely, and vice-versa, while Carlo can actually be effective in zones other than his own, and isn’t a liability on the ice. Again, this is what Bruce Cassidy has gone within the absence of McQuaid. Here’s why it should stay this way. McAvoy’s game is speed, offense, and physicality. He is aggressive to the nth degree. What he needs is a competent safety net to play with if and when he makes a mistake, as rookies are apt to do. Chara can be this guy. He was an excellent mentor to Brandon Carlo last season, but I don’t think McAvoy needs that level of mentorship. Let him figure some of the stuff out on his own, but be there if he can’t or has questions. Chara’s offensive game has been reduced to his shot at this point. He is still an adequate skater for his size and is good enough positionally and physically on his own side of the red line to be a suitable buffer for McAvoy. He just needs to understand that he isn’t 28 anymore, and there is no logical reason for him to act like he’s Bobby Orr like he did in Arizona earlier this season. At this point, you are likely of one of two opinions: either “Wait, what about Adam McQuaid?” or “Why bother with this article, this is just what Cassidy has been playing the last few games.” Well, I’m not going to rehash my thoughts on Adam McQuaid. I wrote an article in the summer detailing his (and Kevan Miller’s admittedly less detrimental) shortcomings. If you haven’t had the chance yet, you can give that a quick read here. I have been Postma’s champion since he was signed. He is, in my opinion, an underrated defenseman, who has yet to receive a legitimate shot to be an every-game sort of guy on the back end. He can jump in on the powerplay if needed and has underrated transition skills. He is good at getting the puck out of his zone and into the offensive zone. Kevan Miller is rough, tough, and has shown glimpses of some real skating and offensive ability. He is also a significant upgrade over McQuaid and is good enough defensively to allow Postma to not be Johnny Oduya on the back end. So, where’s McQuaid? Ideally, he and Matt Beleskey are getting well acquainted with the concessions stand in the press box, and not getting into the lineup. He is a liability in 2 zones and is barely replacement level in his own zone. Basically, he can hit and fight, and there is no need to pay 2+ million dollars and a roster spot for a guy that can only add that to your team. However, I know many of you disagree. I can’t wait to hear your thoughts! Thanks forr this great article, I have shared it on Twitter.